About a month ago now I introduced a project I’d undertaken this season which involved monitoring how defencemen were impacting the territorial battle that’s fought in the neutral zone. As a refresher that involves both their ability to defend their own blueline against incoming attackers, but also how effectively they’re able to transition the puck the other way as well. The purpose of that initial post was mostly just to lay the groundwork and get some of the housekeeping components of the project out of the way. Now that we’re nearly a quarter of the way through the regular season schedule, it’s time to check back in. At this point, enough data has been accrued to get a relatively good picture of which players are holding up their end of the bargain, and which inversely which ones are weighing the rest of the team down. 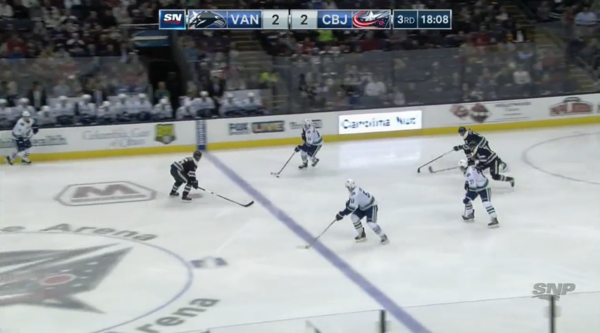 a) Pass-Out: A pass that either travels across the blueline or springs a teammate with a clear path out of the zone is directly completed by the defenceman. b) Carry-Out: The defenceman takes the puck from his own zone and successfully carries it at least a couple of strides past the blueline. 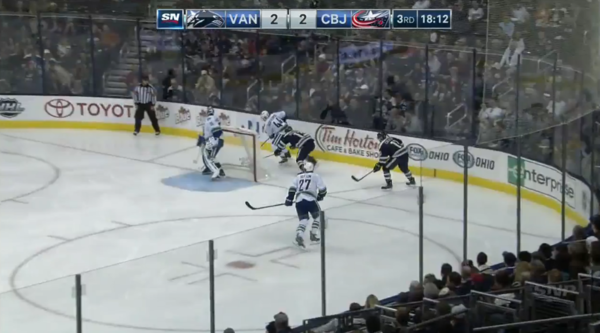 c) Clear/Dump: The puck is cleared from danger and out of the zone, but without possession. This is obviously better than a failed exit, but still not an optimal outcome. 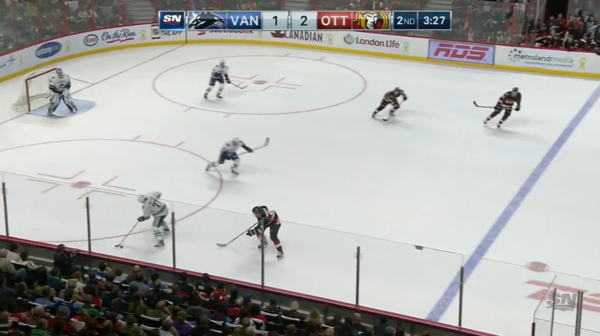 d) Failed Exit: The defenceman is unable to clear the zone. This can either be due to a turnover, a clearing attempt that’s held in at the line, or an icing. While those three may vary in terms of the danger they put the team in, the fact of the matter is that they all ultimately hem the group in its own zone and can lead to unfavourable results. Now that that’s out of the way, let’s dig into the data. While the recent trip out East shined a light on some issues that have been brewing for a while now – like the team’s struggles when it comes to defending in their own zone and suppressing scoring chances against – I don’t think that we can say that their ability to transition from defence to offence was one of them. 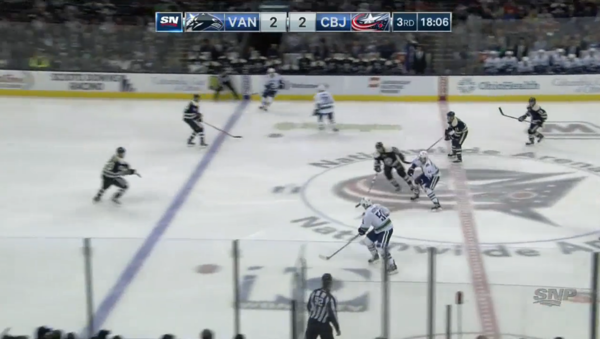 Aside from a particularly sloppy game in Toronto, the specific group of 6 guys they were using for most of the trip was undoubtedly the most effective puck-moving configuration that they can conceivably send out there. 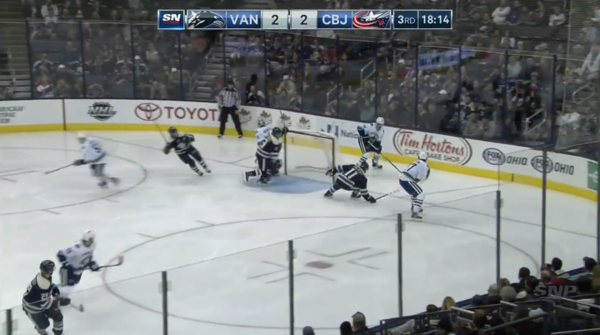 You never wish to see a player get hurt, which is to say it’s good to see that Luca Sbisa’s latest injury setback wasn’t a serious one, but at this point it may have been the only recourse to help save the Canucks from themselves. It’s become abundantly clear that either the management team and/or the coaching staff feel an inexplicable obligation to continue trotting him out there, health permitting, despite every indicator possible suggesting that they shouldn’t. The idea that Sbisa’s absence from the lineup was a possible explanation for the team’s struggles out East was a laughable one, to say the least. It amazes how some people can still allow fluctuations in goaltender performance and percentage peaks and valleys to confound their hockey opinions. We likely wouldn’t even be having this discussion if Ryan Miller had managed to come anywhere near a .900 save percentage over that course of time. At this point, it’s mostly just preaching to the choir, because readers of this blog are surely already aware of how feeble any argument that Luca Sbisa is a worthwhile contributor is. This may not be the greatest timing because of the timing following a couple of noticeably bad gaffes during the most recent game, but the dynamic that Matt Bartkowski’s skating ability brings is a tantalizing one. He has the highest rates of exiting the defensive zone with possession of the puck, which makes intuitive sense considering how frequently he takes the puck out himself (limiting the potential for a tipped pass, or a weird bounce that stops the breakout in its tracks). The nature of his game and skill set can be a curse in the sense that his errors tend to be rather glaring and obvious, but it’s important to understand that he’s not unique in this regard. You have to take the bad with the good because it’s still generally more of a positive net gain than a conservative player who doesn’t make too many noticeable misplays largely due to never attempting anything that’ll help his team generate offence. As you may have noticed Hutton looks fairly comparable to Dan Hamhuis in both exit percentage and failed attempt percentage. However, the important column to look at here is the difference in how frequently the two of them are transitioning the puck with possession. The reality is that Hutton frequently attempts – and successfully completes – things with the puck that his elder would never even dream of doing. 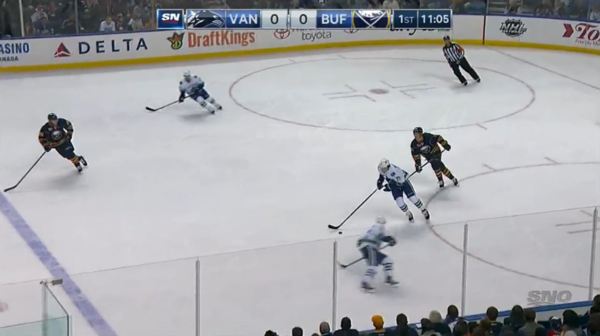 Hamhuis’ season has been littered with plenty of safer clearing attempts out of the zone, whereas Hutton has consistently pushed the play aggressively in the hopes of generating offence with either his passing or his wheels. It has occasionally gotten him into trouble, but god bless him for trying in the first place. The recent news that Travis Hamonic was looking to be traded out West made Canucks fans’ ears perk up immediately, but if there’s truth to the reported cost of doing business being Chris Tanev, then it’s unfortunately a stay-away situation for the team. Hamonic is a fine player in his own right, but Tanev’s continued ascension towards stardom has been wholly gratifying. At this point, there’s no question that Tanev belongs on the list of best non-ELC contracts in the league, seeing as he’s an above average top pairing defenceman carrying a $4.45M cap hit through his age 26-30 seasons. He looks great here, for two reasons. Aside from the fact that he’s as reliable as it gets with the puck on his stick, he must be an absolute nightmare for opposing forwards attempting to set up their attack in the offensive zone. 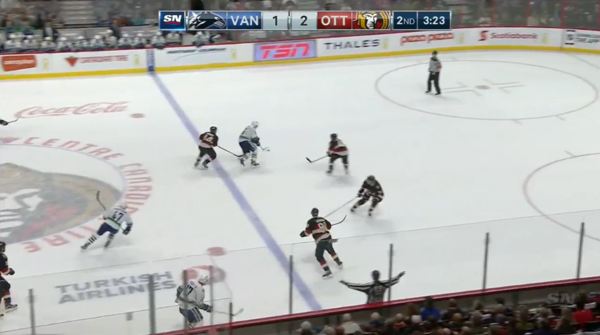 While being physical and taking the body is one way to thwart entries against, Tanev does so just as effectively in an entirely different manner. Much like an Erik Karlsson in this regard, he does so with phenomenal gap control, positioning, and a tirelessly active stick. It remains unclear just how much merit there is to this idea, but it’s at least worth considering that the word has gotten out on him across the league. 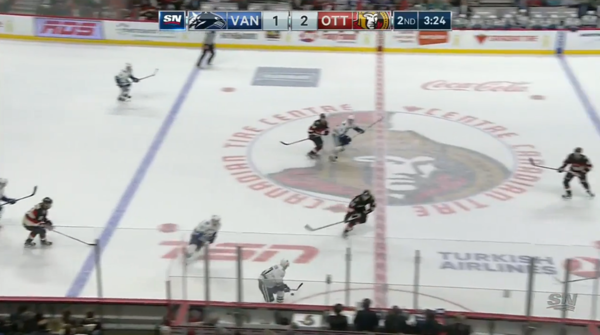 The frequency with which opponents choose to go after his partner Edler instead of challenging him could be entirely random, but it could also quite possibly be a concerted game plan. It’s something that’ll surely be worth monitoring as the season progresses. Finally, it’s worth mentioning that Hamhuis has been much better since returning from his short three-game absence earlier in the month. We noted that much of his and Bartkowski’s shared struggles early on were due to how frequently and easily they were surrendering the blueline. Unfortunately for his partner, Weber has struggled with this, and despite his aforementioned effectiveness in other aspects of the game could find himself on the outside looking in once again with everyone healthy. There’s no denying the Sbisa data here, and sure, if Miller had a better save percentage, we’d have gotten more points on that trip. However, how many of the goals were really soft? I can only think of a couple. A lot seemed from the players in front of him not being able to clear the front of the net of opponents/pucks. Is there a way to quantify this data? It might explain why the Canucks like Sbisa. Or, it might not. I don’t know. I just think that this data, while very useful, only tells part of the story. The “Canucks” like Sbisa because God forbid Benning admits it was a dumbass mistake to sign him and give him a raise. There are no fancy stats that will make Sbisa anything other than a pizza delivery specialist. If Sbisa fell down a well, even Lassie would go for a pee break. If he had skill at guarding the front of the net, that would show up in war-on-ice.com ‘s hextally charts. I haven’t checked, you can take a look yourself. Great article. Nice to see Hutton’s stats accord with the eye test. He has been a revelation and is fun to watch. He already seems to be our most creative Dman. 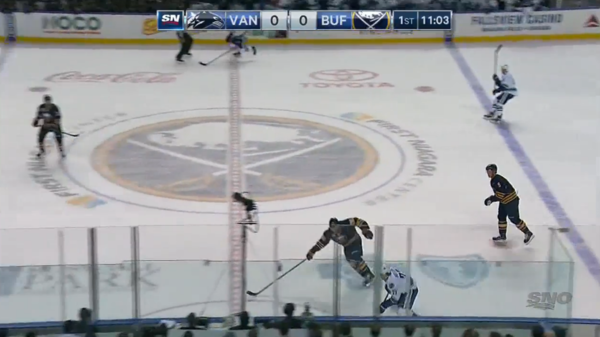 Is it really the case that Sbisa was the guy keeping front of goal clear? To my memory, he’s as soft as they come in that department, I can think of multiple examples from the series against Calgary where Sbisa did absolutely nothing to clear the crease. I don’t doubt the stats in the puck moving department, but the first word in Defenseman is Defense. Bartman can move the puck but he was a disaster down low the last few games. He was over powered and out of position. Special Edler poked his head up the last two games and Hutton has been caught out of position a few times… Understandable for a young guy. The D has to play better D in their own zone, not worry do much about the giddy up to the neutral zone. I would much rather the guys play solid and make an easy out so as not to expose the Goalie. I’m really surprised by Bartkowski, it looks like it would be really nice if he played over Weber and Sbisa. 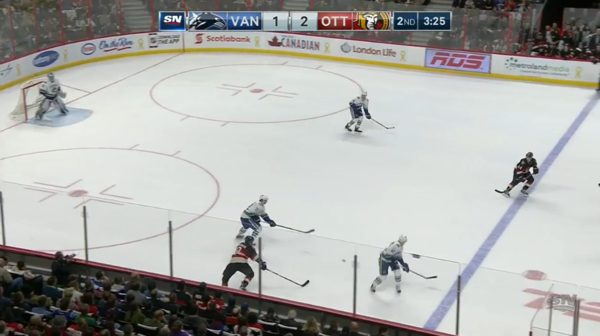 I have a lot of trouble expecting that Weber’s right handed PP shot over having Edler or whomever there comes close to outweighing other parts of the game. With 23% of failed exits amounts to 19 failed exits, or about 1 per game. Tanev has 8% of failed exits, if you do the math that means Tanev has 16 failed exits (granted with far more touches). 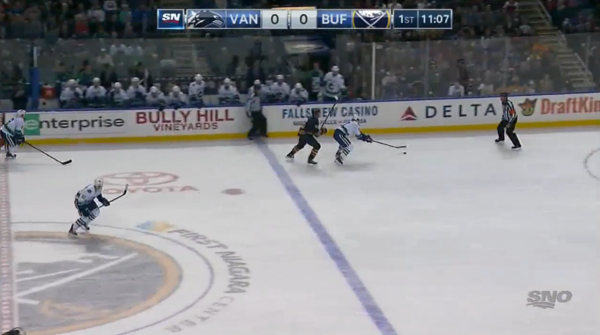 Obviously getting the puck out of the zone isn’t a strong point for Sbisa (although he has gotten better simply by automatically passing it to his partner, whether that’s Hutton or Bartkowski). However when looking at the real world numbers we are talking about 3 more failed exits, in about 1/2 as many touches than Tanev, who generally plays significantly more icetime. While Sbisa is not a great player by any stretch, I don’t think this data makes him out to be as bad as you’re indicating. I’d like a comparison with a Stanley Cup defense corps rosters compared to this one. The Sbisa hate is real for the fancystats drama queens. There’s much more tangibles than just ****** zone entry/exit, CF, percentages. EVERYONE knows the chemistry Hutton and Sbisa have.